Pattaya did its best to truly become the “city of love” on Valentine’s Day. The city was awash in pink and red as shopping malls, markets and public spaces filled every conceivable spot with flowers. Even city hall got into the spirit, erecting heart-shaped, flowery backgrounds for lovers to take photos in front of. 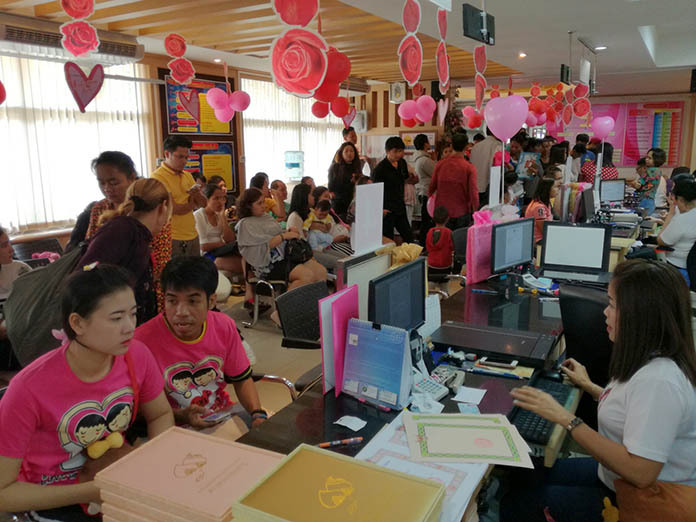 Banglamung District office was busy from the 8 a.m. opening until the 6 p.m. closing with couples registering their marriages. The Surang florist on Central Road went a step further, setting up beautifully decorated booths adorned with teddy bears, roses and pink ribbons for photos. A professional photographer was on hand to do quality portraits on request. Owner Netsurang Raruek said everything from bouquets to floral designs for weddings were available at affordable prices. 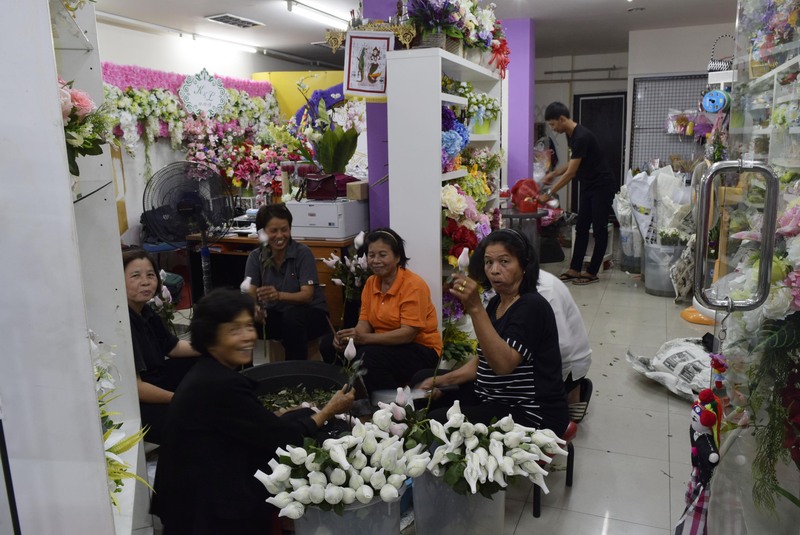 An estimated 100 couples brought their own flowers to their wedding ceremony at the Banglamung District office, which was busy from the 8 a.m. opening until the 6 p.m. closing with couples registering their marriages. A young Australian man and his Thai bride were first in line to get hitched on Valentine’s Day. They attributed the large number of international couples to the holiday’s western origins and standing as a romantic occasion. Miss Ampon Deboaw, Banglamung Bailiff, shown here after writing a legal marriage certificate for a Thai-Japanese couple, also was busy giving out matching love pillows. 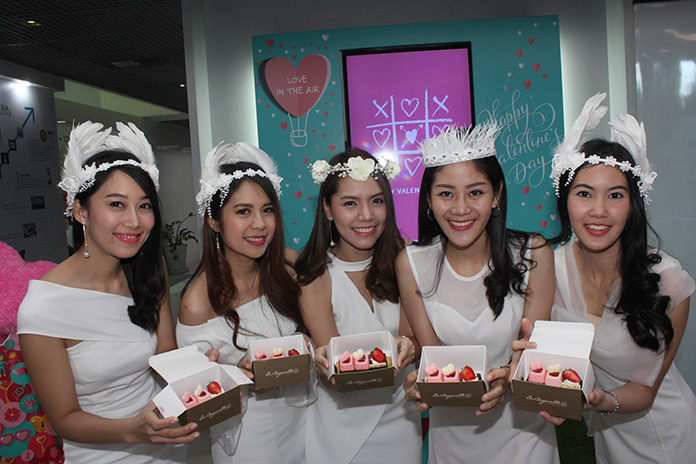 At Bangkok Hospital Pattaya, patients were given a treat on Valentine’s Day as the nurses gave out slices of strawberry chocolate cake from Le Baguette. 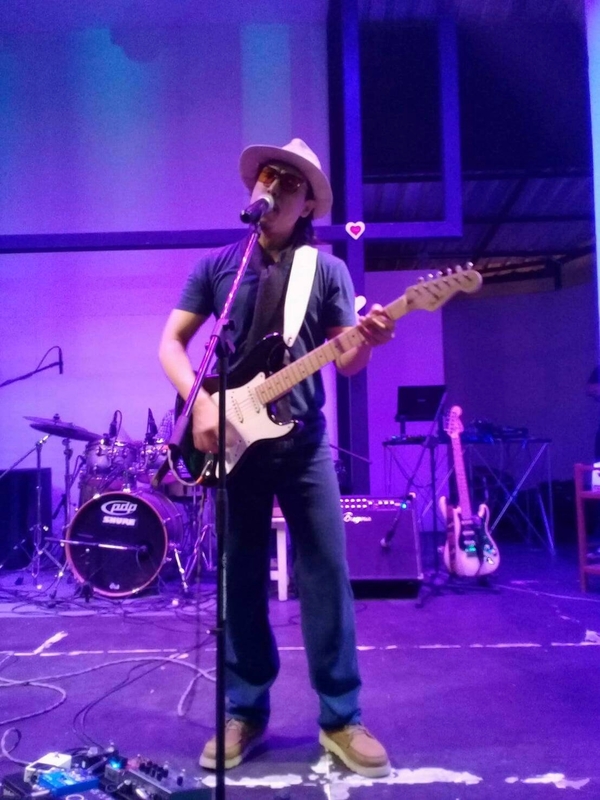 Famous acoustic rock singer Muzu captures customers’ hearts at the Nisha Pub & Restaurant with various songs on Valentine’s Day. It paid to be early at the district office, as the first six couples to register received a set of love pillows from the local government. But District Chief Naris Niramaiwong wasn’t at the office for the joyous day. He was presiding over even more marriage registrations at Central Marina’s “Season of Love” event. 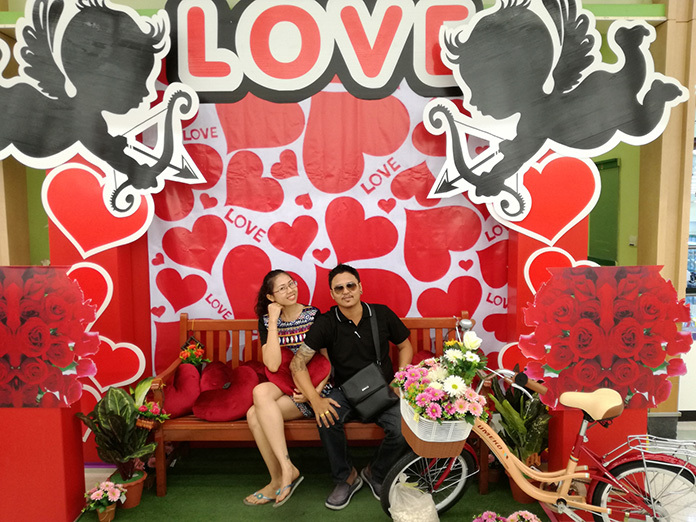 About 10,000 roses turned the North Pattaya mall into a romantic garden and couples strolled a red carpet picking out gifts for their loved ones, including cakes and chocolates. 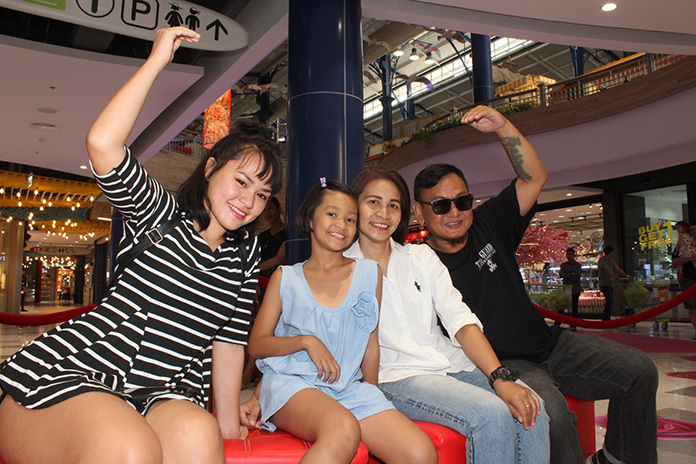 Folk music filled the air and couples received chances to win big prizes as well. Another 99 couples took their vows on the backs of elephants at Nong Nooch Tropical Garden. Park Director Kampol Tansajja hosted the ceremony with Sattahip District Chief Noraset Sritapatso presiding over the legal bits. 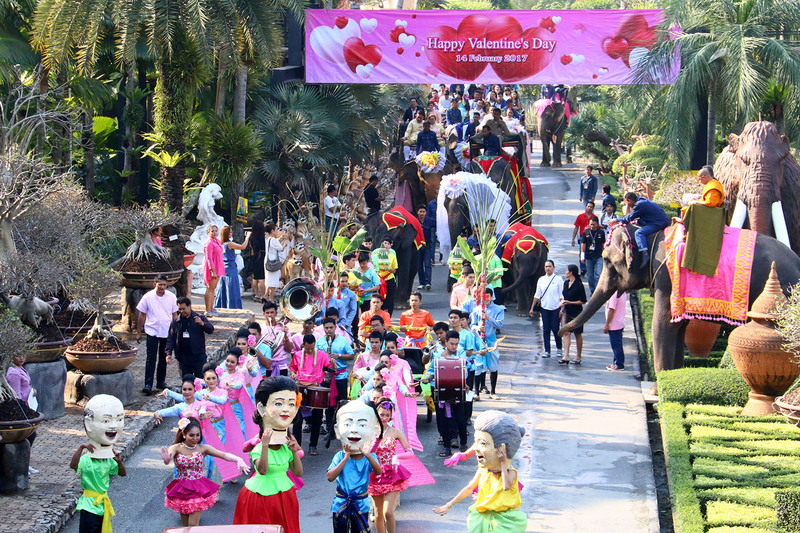 Nong Nooch’s garden was transformed into a big heart-shaped display for the occasion and a parade of elephants carried the newlyweds to photos spots decorated with flowers and teddy bears. Photos also were on the menu at the new Nisha Pub and Restaurant, which set up a stage near its swimming pool for photobugs. Acoustic singer Bantit “Muzu” Chaenuae performed relaxing music for two hours to set the mood. 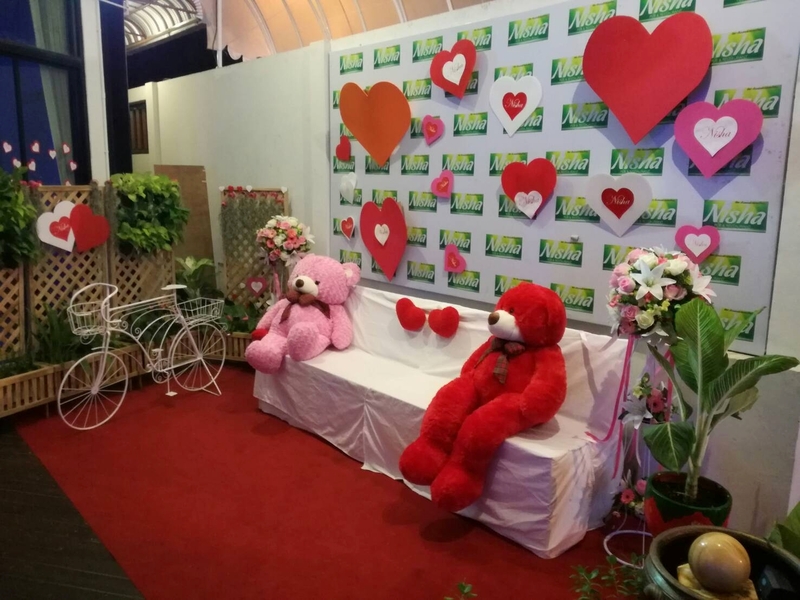 Nisha Pub & Restaurant set up magical d้cor for love filled couples to take photos. 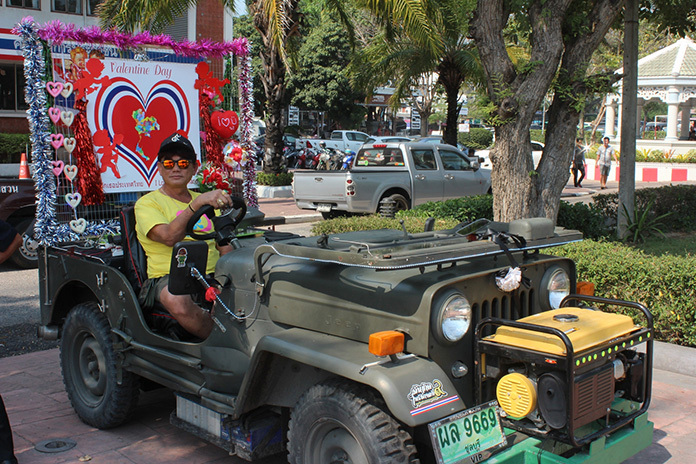 Love me love my Jeep – An old man with a love for Jeeps decorates his for Valentine’s Day. Central Marina set up their Season of Love event with over 10,000 roses. The cornucopia of flowers around Pattaya was fueled by noticeably lower prices for this year’s crop of love blossoms. Last year prices for a single rose often hit 35 baht. This year, thanks to a glut of roses imported from China, prices tumbled to as low as 20 baht each. Thai growers, who continued to keep their eye-watering prices in place, took a shot from Cupid’s arrow in the wallet. 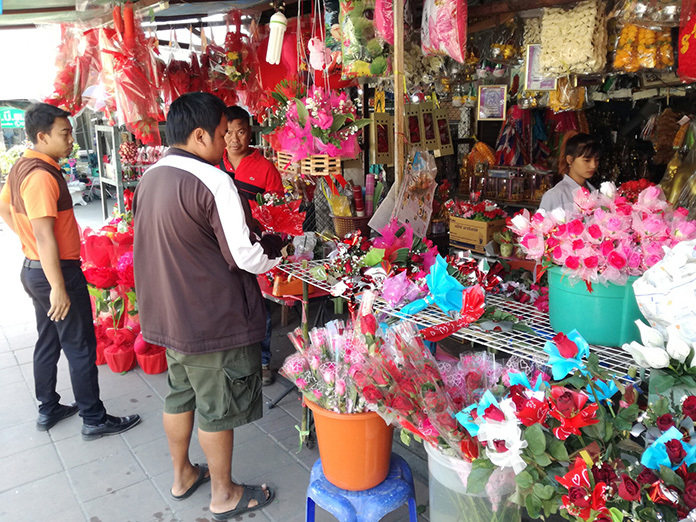 Business was brisk for flowers and arrangements at the Soi Buakhao market, where sellers included balloons and chocolates in their sets to further entice younger buyers. More than a few of those flowers were laid at the foot of the Prince of Chumphon statue on the top of Pratamnak Hill where many couples made wishes for a full love life. Many said they chose to do their prayers and offerings there because it made them feel good and the Pattaya viewpoint is the perfect location to be spiritual and express love to each other. 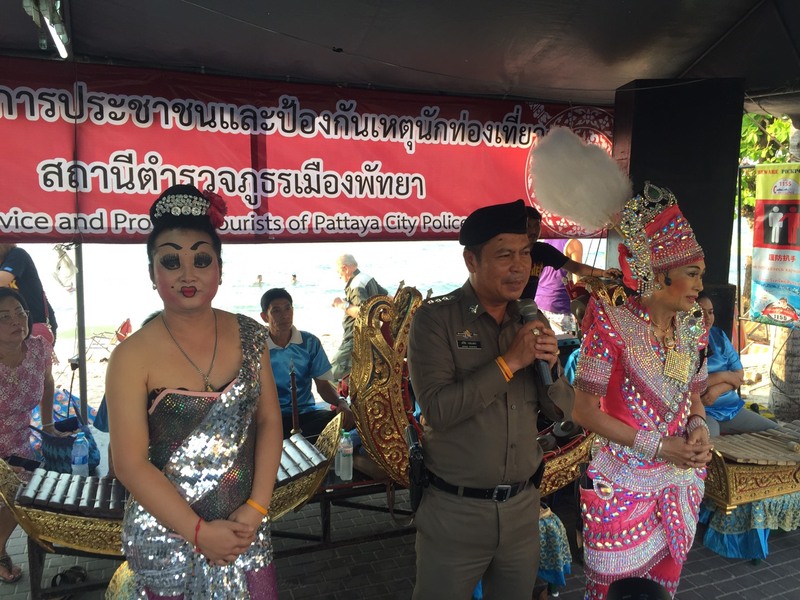 Pattaya Police, meanwhile, put on a musical folk drama show at the Tourist Assistance Center on Pattaya Beach at Soi 13/1. Police chief Pol. Col. Apichai Krobpetch oversaw the “likay” performance and handed out candy to tourists. He said the entertaining show was organized to show the public that police around and looking after tourists and residents alike. Apichai added extra officers were put on during the busy Valentine’s holiday period. Valentine’s Day is a great time to treat the whole family at Central Marina. Pattaya Mail’s Nuch and Jet have been hit by Cupid’s arrows. Shops did a booming business selling flowers and dolls. 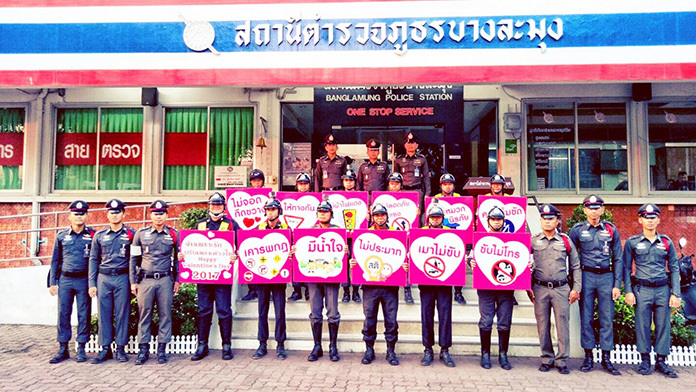 Banglamung Police are all heart at their checkpoints on Valentine’s Day. District Chief Naris Niramaiwong presides over marriage registration for various couples at Central Marina Pattaya. Police Chief Pol. Col. Apichai Krobpetch announces the special Valentine’s Day Likay performance by the Pattaya Police at the Tourist Assistance Center on Pattaya Beach Road. Industrious women are hard at work preparing flowers for Valentine’s Day. 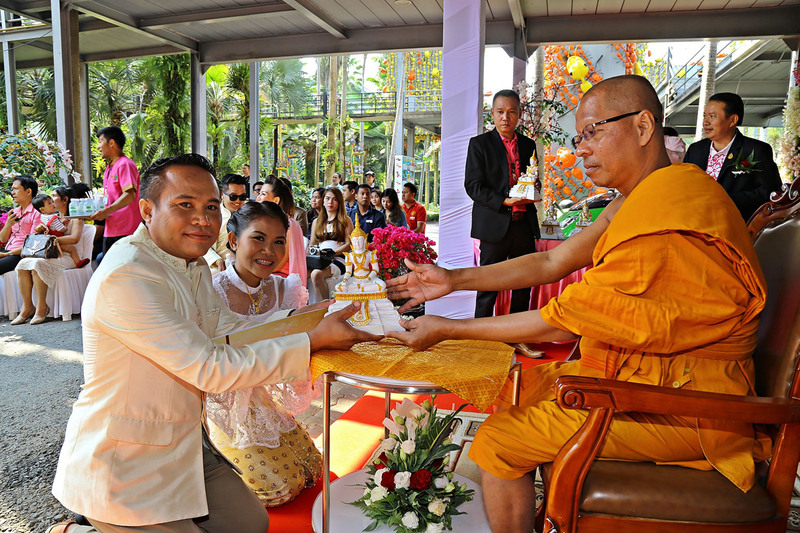 Phra Khru Kasemkithisopon from Wat Samakeebanpoth conducts a religious blessing ceremony a Nong Nooch Tropical Garden. 99 couples took their vows on the backs of elephants at Nong Nooch Tropical Garden. Across town at Bangkok Hospital Pattaya, patients got a treat on Valentine’s Day as the nurses gave out slices of strawberry chocolate cake from Le Baguette. The French bakery restaurant said the cake is a once-a-year creation just for the hospital and is not available on the regular menu.